Climbing the stairs can often become a struggle as you get older – even when you have four legs. 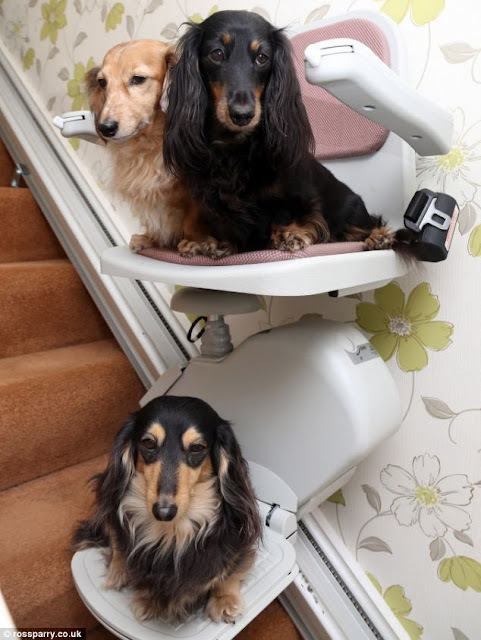 But it is no longer a problem for these three dachshunds after their owners bought them a £1,500 stairlift. Sheila and Harry Lee installed the lift after one of the dogs, six-year-old Pippa, had to undergo a £5,000 operation on her spine. They had been concerned about Pippa and their other dachshunds – Millie, seven, and Heidi six – straining their low-slung bodies as they negotiated the stairs to their beds. ‘We saw an advertisement for the stairlift and thought “Why not?”,’ Mrs Lee, 57, of Ossett, West Yorkshire, said yesterday. Read more and see more fun photos at The Daily Mail. I need to show this to my middle daughter. She was joking about stairlifts when we were talking about the two storey house that her sister and brother-in-law just bought. The lift really will be easier on those doxie backs so I don't see why not. teheheheheh This is just too cute. My heart is melting. I need one for my Smoosh! That is brilliant! Love it. They look so adorable. I think that photo will have put the idea into a lot of people's heads, especially for older dogs.